The year 1826 in architecture involved some significant architectural events and new buildings. January 30 - The Menai Suspension Bridge over the Menai Strait in Wales, designed by Thomas Telford. December 17 - Helsinki Old Church, designed by Carl Ludvig Engel. The Bank of England in London, designed by Sir John Soane. Cumberland Terrace in London, designed by John Nash and John Thompson. 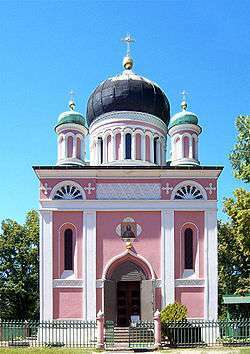 Alexander Nevsky Memorial Church in Potsdam, a very early example of Byzantine Revival architecture designed by Vasily Stasov. ↑ "The Stadttempel Synagogue, Vienna". Beth Hatefutsoth. Retrieved 2009-07-04. ↑ Brownlee, David B. (1986). "Chapter 1". Friedrich Weinbrenner, Architect of Karlsruhe. University of Pennsylvania Press. ↑ Brodie, Fawn (1974). Thomas Jefferson: An Intimate History. W. W. Norton & Company. pp. 87–88.